Being a part of Karnataka, Melukote is nowhere deprived of cultural importance. Home to several old temples and religious sites, it is considered one of the sacred places in Karnataka. Located in the Mandya district, Melukote has its history dating back to the 12th century, when Saint Ramanujacharya stayed in this town for a period of about 12 years. Since then, it has become a significant religious site. Apart from temples, Melukote also harbours numerous historic buildings and lush green surroundings. Being located at a distance of around 50 km from Mysuru, it is easily accessible. So, how about planning a trip to Melukote and learning in detail about its history and importance? Following are the certain unexplored and few major places to visit in Melukote. Cheluvanarayana Swamy Temple is the first and foremost tourist attraction in Melukote. Due to popularity amongst Hindu devotees all over the country, the temples witness thousands of tourists and Hindus every year. Dedicated to Lord Cheluvanarayana, an incarnation of Lord Vishnu, this ancient temple is located on Yadavagiri and Yadugiri Hill. The kings of Mysuru kingdom have presented the temple with jewels, crowns and gems in large quantities. These precious items are brought every year to the temple during the celebrations of Vairamudi festival to beautify the images of Lord Cheluvanarayana and decorate the temple complex. Established in 1977, the Academy of Sanskrit Research houses several research scholars who are appointed to carry out research on different subjects of Sanskrit. Here, you can find hundreds of age-old manuscripts and thousands of ancient texts. The scholars here are subjected to put forth the use of Sanskrit in the early periods and research its evolution. How about learning a little bit of Sanskrit here? 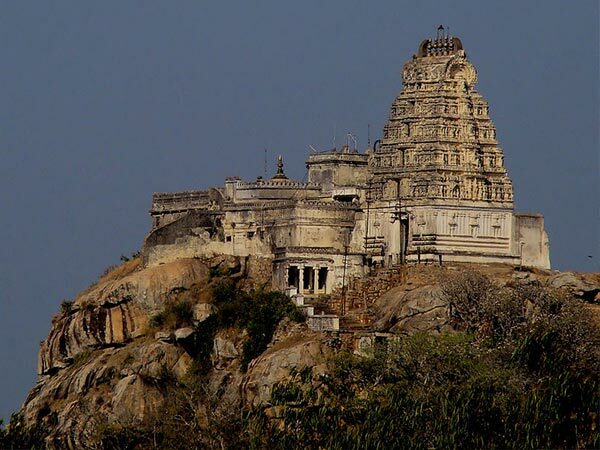 Located atop Yadugiri Hill and overlooking the beautiful town of Melukote, Yoga Narasimha Temple is one of the most visited places in Melukote. As per legends, it is believed that the deity of Lord Narasimha was placed thousands of years ago inside the temple by a devotee, Prahlad. Since then, it has been a major religious site for Hindus. It is also said that the temple has been worshipped by Lord Rama and Lord Krishna as well. The major festival celebrated in the temple is Narasimha Jayanti. Bordered by Melukote temples, Melkote Temple Wildlife Sanctuary is spread over an area of about 50 square kilometres. It is popular for the protection of black buck and grey wolf, which are found in abundance inside the sanctuary. The landscape of this wildlife sanctuary is covered with rocks and deciduous trees. You can also find several species of colourful butterflies here. Also known as Kalyani Pond, this tiny yet beautiful pond is located around the temples providing the surroundings with a calm and relaxing aura. You must visit this beautiful pond if you would love to spend some time in the delightful atmosphere of Melukote and listen to the devotional tunes emerging from the nearby temples. Apart from the above places, Melukote has in store a lot to be explored. You can also visit Raya Gopura, which is a ruined structure and is popular amongst history lovers and Vanaprastha Ashram, which is a preaching centre. Thondanur Lake is another important tourist attraction in Melukote which is considered a holy place amongst the Sri Vaishnava sect of Brahmins.